It’s a well-known fact that children learn best when they’re having fun. Children are also much more likely to understand even complex subjects when they “learn by doing”, an idea that is central to the renowned method of teaching thanks to Montessori material. What also helps children to better remember what they have learnt and to retain it for longer is self-learning. Try these fun electrical engineering activities with your child, for immersive self-leaning alongside their regular educational toys. 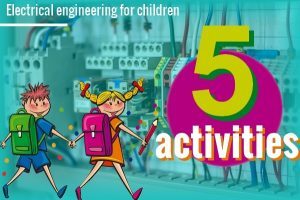 Electrical engineering activities help to improve your child’s logic, math, science and problem-solving skills in a fun hands-on way. The science: Atoms in elements are usually balanced. By rubbing the comb you’ve moved some electrons from one material to another, creating positive and negative charges. This causes the attraction, making the water appear to ‘magically’ bend. As in the previous experiment, statically charge a plastic comb. Place it over a bowl containing salt mixed with pepper. The pepper will move up and stick to the comb. Don’t place the comb too close, or it will attract the salt too! The science: As pepper is lighter than salt it will jump up to the statically-charged comb and cling for longer. You’ll need a 6V battery, copper wire, alligator clips plus a large nail. Wrap the middle of the wire around the nail, then attach an end to each of the battery terminals with your alligator clips. The nail will attract paper clips and other small ferromagnetic objects. Experiment and see how the number of times you wrap the wire around the nail effects the strength of its magnetic qualities. The science: An electromagnet is a temporarily magnetized object. It only works when it has electricity flowing through it as part of the circuit. Electromagnets work because electric currents produce magnetic fields. 4 – Conductor or insulator? This easy experiment lets your child test whether or not various household objects conduct electricity. You’ll need two wires connected to a lightbulb and battery, plus one extra wire and alligator clips. Create a simple circuit so the bulb lights. Then simply remove one wire from the bulb, connect it to one of your test materials and then connect your extra wire to the test material and the bulb creating a circuit. If it lights up, then you’ve got a conductor. The science: Some materials are conductors because their atomic makeup allows some of their electrons to move, this allows the electric charge to be passed through the material. Create a fun game that will test your child’s fine motor skills and help them get to grips with the basics of electrical circuits. You will need a Tupperware or other small lidded plastic or foam box, a metal coat hanger, two AA batteries with a double holder, an LED light and some flexible shielded wire. Make two holes in your box lid and curve the stiff coat hanger wire into a curvy pattern. Place both ends in the holes and make a third hole near the center for your LED. Place the LED legs through the hole and attach one side of the LED to the battery (LEDs are directional so if it doesn’t work at the test stage, swap the side you’ve connected). Connect the other side of the battery holder to the curvy wire. Make a fourth hole in the lid where you will place your flexible wire for holding and playing the game. Attach the bottom of this wire to the LED. Strip the other end of plastic and make a loop. Test it works by touching the curvy wire with the loop, the LED should light up. Have your child try to move the loop from one end of the curvy wire to the other without lighting up the LED. The science: When the loop touches the curvy wire the circuit is complete, allowing the flow of electrons which lights the bulb. Have fun and above all stay safe, always supervise your child and never leave them unattended whilst they perform any type of experiment. Rather than immediately answering questions, try to suggest ways they can find out more through trial and error and their own experiments. Cause self-learning is the key. This can be followed up with a more in-depth explanation that can be related to their findings for improved understanding and greater enthusiasm. If you have other ideas for children, please share them in the comments below. Thanks! or copy this trackback: http://engineering.electrical-equipment.org/others/electrical-engineering-activities-children.html/trackback from your own site.